New Carrot Cake Oreo cookies can now be found at retailers nationwide. The permanent flavor features carrot cake-flavored wafers and cream cheese frosting-flavored creme. It joins a current slate of baked dessert-flavored Oreos that includes Red Velvet, Cinnamon Bun, and Chocolate Peanut Butter Pie. 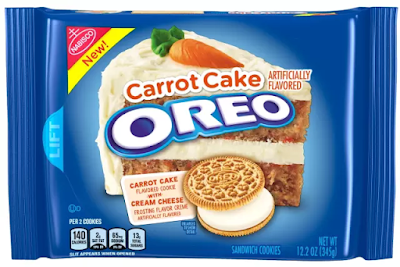 Carrot Cake Oreos come in 12.2-oz packages for $2.99 each. If you're having problems locating it nearby, Target has it available for shipping online.